As we walked towards the cheese display at our grocery store this past Saturday, Andrew remarked, "God, I have never eaten so much cheese in my life." It's true. Wine and cheese has become a weekly (sometimes twice weekly) event, whether it's the main attraction or the appetizer beforehand. And while it's usually tasty and wonderful, the real reasons it has become such a staple in this tiny Asian household are the people who come to consume it. Lately Andrew and I have been cooking. A lot. For many reasons, I suppose - it saves hellllla bunch of money. We eat a little healthier this way. And generally, it's a great way to relieve the stress of the day, it's an activity we enjoy. But by far the best reason I can think up is that at the end of the prep work, the simmering, the sauteing, the plating (and inevitably the Instagram photo that follows) (judge me, go ahead), it gives us a chance to share a moment as we taste what we've created. We can catch up on each other's lives and talk about something we learned, whether medical or not-so-medical. We debrief if we've had a rough day and laugh at ourselves if we've had an embarrassing moment to shake off. And at the end of the meal, something has changed in my psyche. I feel satiated, satisfied. I have nourished my soul and my stomach in one simple, everyday move. And while I enjoy an indulgent dinner and drinks out with friends every now and then, I love having said friends over to our house instead for an evening with lots of homey goodness, snacks, and plennnnnty of wine. For multiple reasons. For one thing, no one cares what you wear over here - I will be the first to tell you my go-to style tends to lean heavily on the, ahem, "athleisure" side of outfits. We are a judgment free household, so wear your joggers as you please. Secondly, along the same lines, you can say whatever you want without the potential for public embarrassment. All about the privacy here. And lastly, most importantly, you get to spread that wonderful phenomenon of nourishment like I described above. A little good food, a little booze, and a lot of friendship that leaves you with the happiest heart. It's a freaking beautiful synergy of the simplest things. Besides, everyone needs to eat. Why not do a little bit for your soul while you're at it? I understand I come from the lens of an extrovert, and that socializing might not be everyone's cup of tea. If you're more of a sensitive, beautiful introverted soul, I highly recommend checking out Renee over at Will Frolic For Food. But if you're like me, someone who loves to the kitchen and loves to cozy up with friends with a glass of wine in hand, I just wanted to kindly remind you that bringing others together for a home cooked meal - with one, five, or twenty friends and any number in between - can be one of the best things you can do for yourself. Bottom line, just share what you love to do. This is aptly called the summer leftovers loaf because that is exactly what it was - chopped up bits of sweet peppers that were starting to get soft, parsley that was starting to yellow at the ends, bits of cheese from our steak and wine dinner party on Friday, whatever garlic remained from the week. The base of the bread comes from my favorite bread book, Artisan Bread in Five Minutes a Day - so stupidly simple and perfect for someone like me who wants fresh bread but doesn't have the luxury of being at home all day. Zoe and Jeff are pure geniuses with this clever way to get a toasty, warm loaf in a household of busy folks. Also Jeff is a doctor?! Which makes it extra cool to me. 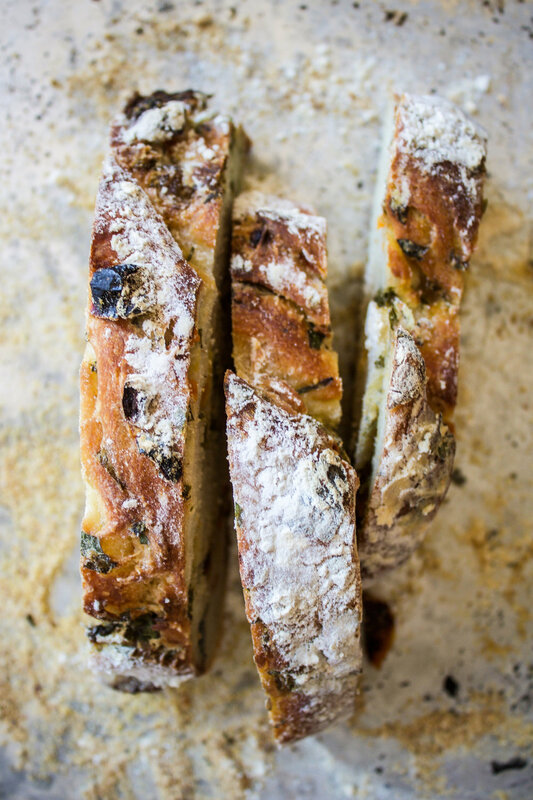 Anyways, all together this makes for a lovely savory bread that would go well with a pat of butter and sprinkled with black pepper, or a homemade pesto with sun-dried tomatoes, or maybe some smashed roasted garlic?! Endless possibilities. Place the water (100 degrees F) in a large bowl. Add the yeast and salt to the water and whisk. Don't worry about getting it all to dissolve. Add the flour to the bowl. Using a wooden spoon, mix the dough together until it is shaggy in appearance - basically, all the flour will be incorporated but it won't be smooth and elastic since we aren't kneading the dough! Loosely cover the bowl with plastic wrap and let the dough rest for 2 hours in a warm environment. After 2 hours, place in the fridge until you are ready to use the dough - it can keep in the fridge for about a week. Heat up the olive oil in a large cast iron skillet over medium heat, then add the peppers and garlic and saute until the peppers are softened. Salt to taste. Remove from the heat and add to a bowl and allow it to cool. While your peppers are cooling, place parchment paper on a cookie sheet and dust the bottom with cornmeal. Set aside. When you're ready to bake your bread, remove the dough from the fridge and dust the top with flour. Add your peppers, garlic, parsley, and cheese to the dough. Using your hands, gently mix the dough so that the add-ins are well incorporated throughout. Try not to overwork the dough at this step. Split the dough into 2 evenly sized balls. Dust each loaf again with some flour and then shape each loaf quickly into a ball. Try not to add too much flour and work quickly. This takes practice, don't fret if it's not too pretty the first few times - it will still taste great! Place each ball of dough onto the cookie sheet. Let the dough rest for 40 minutes. While your dough is resting, preheat your oven to 450 F with a sheet pan inside the oven on the middle rack and a broiler pan at the bottom of the oven. After 40 minutes, dust the top of each loaf liberally with flour. Using a sharp knife, slash the tops of the loaves with 3 horizontal slashes - this will help your bread rise and expand. Taking the cookie sheet to the oven, slide your parchment paper (with the loaves on it) over to the hot sheet pan in the oven. Quickly but carefully pour 1 cup of water into the broiler tray and close the oven door. This creates steam that will help make your bread rise and also will give it that crispy exterior! Let the loaves bake for 30 minutes. After 30 minutes, carefully remove the parchment paper from the loaves in the oven - this will help the loaves become crispy on the bottom. Let the loaves bake for another 15 minutes or until the loaf is browned and firm to the touch, and sounds hollow when tapped.